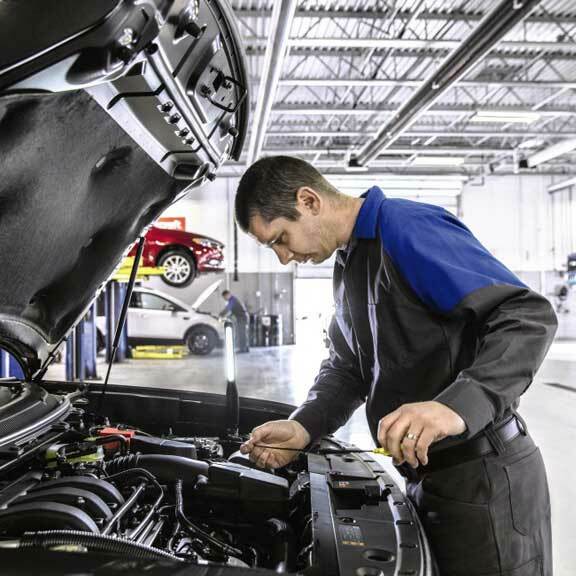 At Capistrano Ford, an oil change is so much more than just an oil change. When you come in for The Works,® you receive a complete vehicle checkup that includes a synthetic blend oil change, tire rotation and pressure check, brake inspection, Multi-Point Inspection, fluid top-off, battery test, and filter, belts and hoses check — all for a very competitive price. Keep your engine healthy and prolong the life of your car with regularly scheduled oil changes at Capistrano Ford. Changing your oil regularly is the most cost effective preventative maintenance and will help keep all of your engine running strong. The expert technicians at the Capistrano Ford Service Department know exactly what type of engine oil your vehicle needs, whether it’s conventional or full-synthetic. We only use high-quality oil and oil filters, so you can rest easy knowing your car’s engine will perform, even in harsh conditions. We also will check all of your other fluids and filters, such as brake fluid, coolant and air filters to make sure your vehicle is properly maintained. We often have coupons and specials for auto maintenance and oil change service in San Juan Capistrano, CA.